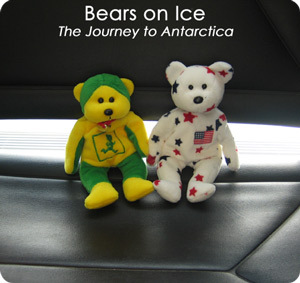 This journal by Berkley, an American bear, and his friend OzGold, an Australian bear, depicts their adventures as they accompanied the PRISM team to McMurdo Station, Antarctica in the winter of 2005-2006. Each chapter contains 3-8 photos and text. Some chapters have links to information or games outside the PRISM site. Links will open in a different window. To view the journals, it is recommended that you have at least Flash Player 7 installed on your computer (unless you would like to view the text version). Click here to download and install the latest version if you do not have it already.